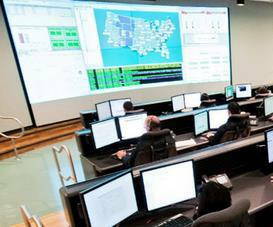 Data Center monitoring and control is a critical element of maintaining maximum availability for your critical operations. PTS emphasizes utilizing IP and Web technologies to oversee and control critical support systems from just about anywhere. PTS’s criteria for both support infrastructure systems monitoring and information technology infrastructure monitoring is the same. We believe it vital that monitoring and control systems be cost effective, quickly deployed and implemented, easy to use, utilize intuitive alarming and escalation methodologies and provide robust reporting all from a central, secure, location. PTS’ Data Center Monitoring & Control Services is the tenth (10) of the eleven (11) step progression of the data center project process. Data Center Implementation Services constitute the pre-installation, installation, testing, and turnover of IT infrastructure within a data center, computer room, server room, or network operations center (NOC) facility. Whether you have a single facility or multiple locations, properly managing data center assets minimizes downtime and ensures business continuity. New highly customizable solutions exist that aid in providing a single point of access for all your monitoring needs. These fully scalable systems can provide the valuable monitoring, alarming, trending and control information needed to not only react, but anticipate potential problems.